Anurag (Parth Samthaan) is tensed as what will happen now. Outside the mall, the police have arrived and make the crowd calm so that they can do their work and save the people. Veena and Mohini get into an argument and blame each other. Inside the mall, the goon who is pointing the gun on Prerna is going to shoot her, just then Anurag throws a bottle on him and release Prerna from his grip and fights with all the goons. Anurag gets angry and beat the goon who touched Prerna. Komolika tells him to stop, Prerna sees him fighting and thinks he only loves her. There Komolika sees this and thinks he loves Prerna and not her and gets angry. The police come and take them goons with them, seeing Anurag and Komolika save Mohini is happy and hugs them. There Veena is also happy to see Prerna and Shivani unhurt. They all go home, Prerna thinks about Anurag, Shivani comes and tells her that this time also Anurag helped her and that he loves her today also like he used to love her before. There Komolika comes home, Mishka asks her is she is fine and why is she so angry. Komolika says that now also Anurag loves Prerna as he saved her from the goons and this is not acceptable. There Anurag is telling Anupam that now Komolika will think that he only loves Prerna and Prerna also will think that he loves her. Anurag is confused as what he will do now so that Komolika will not get mad at him. Anurag goes behind Komolika to make her understand, just then Prerna comes there. Komolika seeing Prerna gets more wild on Anurag. Anurag says that he did this to save their marriage ring and not Prerna. Hearing this all Prerna feels bad and thinks he does not love her he did this all for Komolika as he loves her. Prerna thinks that Komolika is feeling jealous as Anurag helped her so she should take advantage of this and use against Anurag. Meanwhile, as the groom and his family come to see Shivani, a friend of Ronit informs him about this. 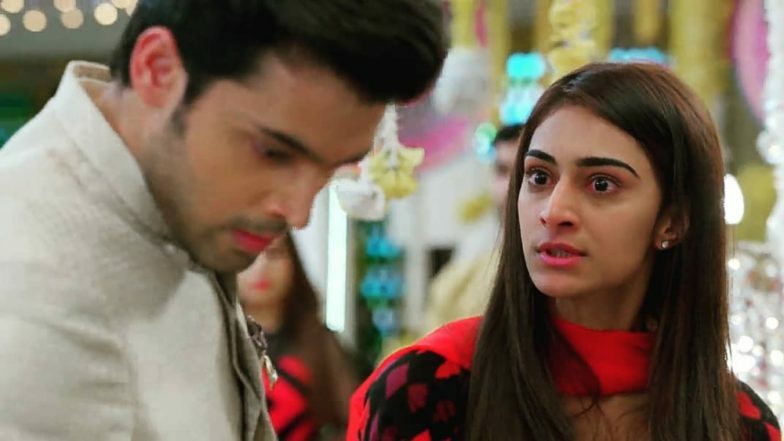 Prerna comes to talk to Komolika and tells that whatever Anurag told about her ring is not true and that he still loves her and had told not to say this to Komolika. In the precap, Prerna tells Anurag that he cannot love anyone and that he does not know what love is. Prerna tells Anurag he just married Komolika for a deal. The police come to arrest Prerna.